I received this snack in my February box from Graze. I don’t usually pair similarly snacks with teas, but I decided to eat this snack with this Cranberry Black Tea from A. C. Perch. I found that the cranberry snack really brought out the cranberry notes in the tea. It was an interesting experiment! Cranberry and coconut are two flavors that I wouldn’t think to mix, but I like them together. The sweetness of the coconut softens the tart notes of the cranberry. I like the texture of the coconut shred. It almost reminds me of the coconut chips that I love from Dang, although they are a little less dry. They have a little more moisture to them, and as a result, they’re a little less crisp than the coconut chips. But they still have a really nice texture and I like the contrast to the snap of the coconut to the chewy cranberry and the creamy chocolate. The chocolate is absolutely my favorite thing about this mix, and I’m glad that they didn’t skimp on the chocolate drops. I “liked” this one. It isn’t my favorite snack that I’ve gotten from Graze, but I do like the combination of chocolate, coconut and cranberry, and I wouldn’t mind getting this snack in the future. I received both of these squares from Jer’s in my January Love with Food box. Jer’s Original Squares are crafted with all natural Valencia peanut butter mixed with crunchy rice crisp covered in premium milk chocolate. Now, you can have Jer’s Squares 4 oz. boxes on hand at work, at home, or on the go! That’s what we call “out of the box” thinking! The peanut butter center is lightened up with the crackly crunch of rice crisp. The chocolate is sweet and creamy, the peanut butter is too, but there is enough “salty” to it to give it a nice savory quality and to cut through some of the sweet. I’d take these over a peanut butter cup any day! Pretzo Change-O Milk Chocolate squares are crafted with sweet and salty pretzel bits mixed with all natural Valencia peanut butter covered in milk chocolate. These 4 oz. boxes are great for sharing, putting into a candy dish at your house or office, or stashed away for that quick fix when needed. After all, that’s how we’re able to pack big flavor into such a little package. The Pretzo Chango-O is also a milk chocolate candy. Instead of the crispy rice in the original square … this has salty pretzel bits which adds more salt to the treat. The center is a little denser than the original was because of the pretzel bits, and it’s crunchier. But I love the additional salty notes to this square. Of the two, this one was my favorite, but I loved them both! This is truly a salty-sweet treat! I want more of these! That is all. My February Box from Knoshy is Here! My box from Knoshy actually arrived a few days ago. This month’s theme is “Movie Night” and while I love the theme … some of the items in the box are curious choices for the theme. I can see the connection with two of the items … the other two have left me wondering! The first item that makes sense to me: Parmesan & Rosemary flavored Microwave Popcorn from Quinn Popcorn. I mean, who doesn’t want popcorn when watching a movie? I’ve tried the Vermont Maple & Sea Salt Popcorn from this company, so I was really excited to try this flavor. The second item that makes sense: Pop Corn Pop chocolate bar from Chuao Chocolate. Again … popcorn! And of course, a candy bar is always a welcome treat at the movies! I’ve tried at least one or two flavors from Chuao Chocolatier, and they are the producers of one of my very favorite chocolate bars (the firecracker bar!) so I’m thrilled to be able to try something else from them. 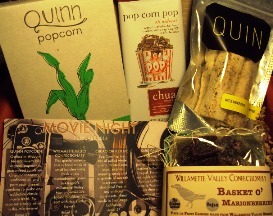 The next item in the box is a Basket o’ Marionberries from Willamette Valley Confectionery. Now, don’t get me wrong – I LOVE these things. I’ve tried them before, and I was thrilled to find them in my box this month, but, what do they have to do with Movie Night? I guess candy is something yummy to eat at the movies? I don’t really get a clear connection, but I’m happy to be have these yummy confections again, so I’m not complaining. Oh well, I like hand crafted marshmallows, so I’ll give ’em a try. A coffee flavored marshmallow should be tasty in a hot chocolate, right? And I’m really excited about the other products in this month’s box! What do you get when toasted coconut and mint are combined with organic 45 percent milk chocolate? A cool, sweet tropical breeze in chocolate form! This limited seasonal release is one of our favorite bars to enjoy during the holidays. I received this chocolate bar in my December box from Knoshy. I wanted to go with a pure, unflavored tea so that nothing would compete with the flavors of the bar. And because this is milk chocolate, I thought that a black tea might be a bit too strong, so I opted for a creamy green tea like this Magical Mao Jian Green Tea from Teasenz. The tea is light and crisp and doesn’t attempt to interfere with the delicious chocolate, coconut and mint flavors … instead, the light, buttery note seems to complement these notes. Nice! Oh my goodness … I love this chocolate bar. I love chocolate. That’s no big secret by now. Usually I prefer dark chocolate to milk chocolate … but, this is so good, and I think that the creaminess of the milk chocolate works in the confections favor. The creaminess of the milk chocolate melds beautifully with the coconut. And while I thought at first that coconut and mint were kind of a “weird” flavor combination, those thoughts vanished with my first bite. Oh wow! So good! The coconut adds a delicious coconut-y flavor and texture. The mint is cool and refreshing. Together the mint, coconut and chocolate create the perfect marriage of flavors. I am in love with this chocolate bar. I received this snack in my January Graze Box. This was a yummy tea time snack with a cup of single estate black tea like this Lovers Leap Estate Indigo from Eden Grove. The tea is a flavorful Ceylon and the rich flavor complemented the tasty Cookies & Cream concept of this snack. This is a tasty “trail mix” like snack that is different from any trail mix that I’ve ever tasted. First, you have tiny little crunchy chocolate cookies that are quite yummy on their own, but also tasty when you eat them with any of the other ingredients too. They’re crunchy and sweet, but not too dense or hard. 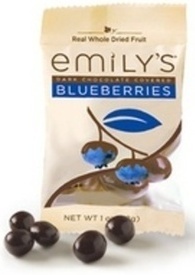 Quite delightful to pop in the mouth and eat … a box of these would be gone in short time, so it’s a good thing that I have a limited quantity in front of me. Then there are nickle-sized discs of white chocolate. Creamy and yummy. White chocolate is not my favorite way to eat chocolate, but, I like these little discs and they add a tasty “creamy” element to the cookies & cream idea behind this snack. There are even a few hazelnuts, and these are a nice addition too. Crunchy and delicious, I love to eat one and then pop one of the cookies in my mouth, it’s a tasty flavor combination. Neither the hazelnuts nor the sunflower kernels were particularly salty, and I found myself wishing that there was a bit more salt factor to this sweet snack because I love the combination of salty and sweet. I “liked” this one. It’s not my favorite snack from Graze, but, I enjoyed it enough to want to have it again on occasion.